The word epidemic is not used lightly by the Centers for Disease Control and Prevention (CDC), but that is exactly the word being used to describe flu season 2012-2013. According to reports from the CDC, more than 7% of all deaths in the United States the week of January 4th, 2013 were attributed to cases of the flu and pneumonia. The United States is broken into 10 regions. Nine of the 10 regions have reported increased flu activity compared to last year’s reports. The only region safe from the flu appears to be California and the southwest U.S.
Not all patients will present with all listed symptoms. Some people suffer from fever and fatigue while others have no fever, but do have vomiting and diarrhea. 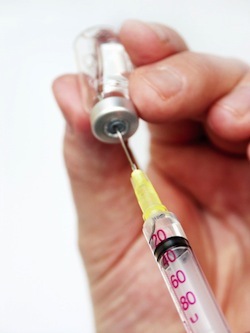 The first line of defense against the flu is vaccination. This year’s vaccination is about 60% effective, which means you still have a chance of contracting the flu if you are vaccinated, but symptoms may be less severe after vaccination. Maintain a healthy diet and exercise. Avoid touching your mouth, nose or eyes after coming in contact with other people. What Does Having the Flu Mean for Pregnant Women? Contracting the flu while pregnant can be dangerous. If you feel you have the flu, contact your obstetrician immediately for an appointment. The influenza virus has been shown to increase risk of premature labor and preterm birth. Studies have also shown a possible connection between fever during pregnancy and birth defects and autism.